Some of my friends are feeling crummy; sore throat or body aches, chills- Well, it is cold/virus season, the weather is freeeeezing here in Connecticut, and it is easy to get run down. It’s a stressful time of year physically and emotionally and we need to take care of ourselves. When the sun sets so early, I just want to put on my pajamas and snuggle down with a book. It’s dark and cold and I wish I could just hybernate but I’ve had to do a lot of running around and now I’m feeling crummy, too. I really don’t want to get sick because then my good friend, Teresa won’t want to come over for tea. So, I have boiled up one of my favorite and yummy natural home remedies. Loaded with antioxidant quercetin, elderberry has antihistamine and anti-inflammatory properties. I like to boil the dried berries: 1/2 cup berries boiled with some ginger in 6 cups of water for 20 minutes. Sweeten to taste. YUM! Next summer I will have my own Elderberries to pick. And, as my kids say: BOOM! Healthy me, sick in bed with the flu. Just last week I was smugly telling myself in the mirror that I was so strong and healthy and had beat this winter’s illnesses. Whack! Take that, Ms. Spear. Pride is an illness and I’ll never smile at the flu again, I promise. Perhaps taking Oscillococcinum at the first sign of illness helped lessen the severity of my symptoms, but I’ve still been down for 5 days and don’t think I’ll be out dancing tomorrow. 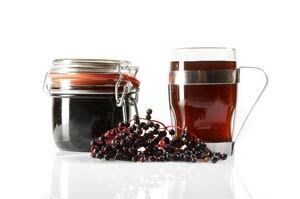 I also consistently took Elderberry syrup until I finished the bottle, yummy, sweet and sticky. Vitamin C, an expectorant cough syrup for my unproductive, hacking cough and lots of water, tea. Hot baths with epsom salt felt great on those achey joints. Beautiful essential oils for congestion and breathing easy. Nikken’s Greenzymes and lactoferrin for my digestion. And, I’m still here in bed. Boohoo. A friend commented that maybe I’m supposed to be goofing off for a few days. Well, I’ve caught up on Lost and MadMen, what else do you suggest? I welcome your comments and well wishes. I’m sick in bed with the flu or something that is lingering and not changing. Feeling crummy. The kitties are lying around taking up too much of my precious space. What kind of caption would I give that?? It’s lolcat time. There is nothing like a lil lolcat action to brighten up my otherwise miserable afternoon. U wants to know whatza lolcat? If you didn’t click the previous link then I’ll tell you, briefly, a lolcat is a funny, captioned photograph, usually of a cat or other animal being a quintessential, yet human-like animal. The caption is usually in a special slang that my kids have used for years- obviously they knew about lolcats way before I did. The slang or patois is said to be internet slang. Whatevah u sez. Urban dictionary sez dis. 10) Use the word “with” inappropriately. 11) If you really can’t wrap your head around the concepts behind “Engrish”, try this: Go tobabelfish.altavista.com, type your desired comment in, hit “english-to-Japanese”, then re-translate back to English. You have to be able to view special characters (the kanji). If you can’t get that to work, try translating to a different, european-text language, like German. Gud lol kittehs, go ketch dinneh.